Atheism: A Lack of Unbelief? I’m sorry, but I cannot believe this. I cannot believe that the weight of what’s valuable and what’s not in the universe rests on our tiny, petty little shoulders. It’s too heavy a burden to be carried by mere mortals, who appear and disappear in the blink of an eye. I don’t believe that someone is worth nothing if he’s considered worthless by the human community, including himself. In short, I don’t believe, unlike the old Greek philosopher Protagoras, that “man is the measure of all things” in these matters. A person’s worth cannot be determined solely by human perception and judgment. Man is not simply the child of a “social other”, i.e. the product of a man-made social environment in which he gains or loses a sense of (self-) worth. He’s also, following the thoughts of people like James Alison and Emmanuel Levinas, a child of “the other Other”, and we should postpone any final judgment on other people and ourselves. Theologically speaking, this kind of “eschatological reservation” is quite liberating, not just for ourselves, but also for our neighbors. The lurking alternative seems human totalitarianism, meaning the aspiration of man – on an individual or collective level – to have total control in determining what and who is valuable, and what and who is worthless. I’d say we better accept the limitedness of our existence, and leave the perfection of the world to “the Infinite One”, you know, “God”. Unlike my atheist colleagues, I don’t believe we should try to occupy His kind of place. This unbelief makes me a believer, I believe… And indeed: “Every finite spirit believes either in a God or in an idol” (Max Scheler, 1874-1928). Right on, Max! Is there any value in any human being on a cosmic scale? Nope. Every human being is completely irrelevant for the universe. Even the one human being who will press the button and destroy earth is, on a cosmic scale, not even a footnote. So, the absolute value of every human being to the universe is so small, that zero is a perfectly valid approximation. So, the absolute value is zero. But is that what we think of if we talk about value? Not really. First of all, most western people agree, that every human life has value (for example, by declaring that murder is unacceptable). Does this mean, that this value is absolute? Of course not, the value is just a part of the social norms we have. If these norms were different, people might have no value at all (in some societies, members of low castes, for example, were considered of low value). Is one of these norms better if you ask from an absolute point of view? No, not at all. The universe doesn’t care. But… Is one of these norms better if you ask humans? Of course. One makes more people happier, leads to a better society, etc. Using these criteria, we can come to the conclusion, that (for humans) one system is better than the other. So, in the end, we can decide, that a system that allows people to decide that other people have no value (even consensually) is not as good as one where every person has value that cannot be taken from him or her. To answer your question: No, no human has absolute value. But systems that give value to every human can be considered better than systems that don’t. No god required, just because you can’t cope with the fact that, in the end, we all are totally insignificant for the universe. No human has absolute value, or is intrinsically valuable if you indeed take an atheist position. You cannot prove that what most people perceive, think or agree upon is or should be the (absolute and only) standard for judging. This is a matter of belief. I don’t believe this. I fully agree with you. But, as a Christian, I believe we do matter to God. “The eternal silence of infinite spaces frightens me. Why now rather than then? Who has put me here? By whose order and direction have this place and time have been ascribed to me? We travel in a vast sphere, always drifting in the uncertain, pulled from one side to another. Whenever we find a fixed point to attach and to fasten ourselves, it shifts and leaves us; and if we follow it, it eludes our grasp, slips past us, and vanishes for ever. Nothing stays for us. This is our natural condition, most contrary to our inclination; we burn with desires to find solid ground and an ultimate and solid foundation for building a tower reaching to the Infinite. But always these bases crack, and the earth obstinately opens up into abysses. Depends on your definition of “prove”. You cannot prove it absolutely or even in a, let’s say, mathematical way, true, but you can simply measure happiness (simply by making psychological tests) in different systems and compare the results. Or you can simply examine the society, the crime statistics, etc. and get conclusion from there. And you didn’t understand me. There IS NO absolute and only standard for judging. 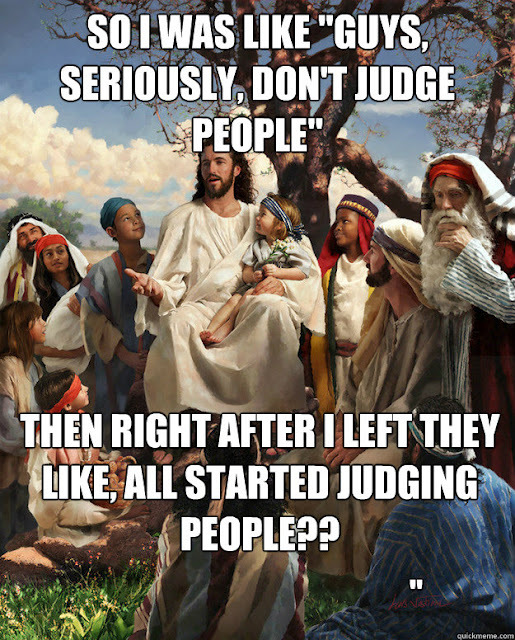 EVERY standard of judging is relative. So I don’t claim that the majority defines such an absolute standard, they can’t. But that doesn’t mean that you cannot compare relative standards and see, which one is best for human beings (which, of course, is also relative). On the other hand… Christians simply CLAIM to have an absolute standard, but honestly. Look around, open your eyes, see the lie. If there is a god, he never bothered to tell anyone this standard. You say: “But you can simply measure happiness etc.” This again depends on your criteria to define happiness. All very relative, but you imply this. Sorry I misunderstood you on the role of the majority. The whole point is: Christians claim that there is an absolute standard, but they don’t have it. No human being has it. It’s unknowable to humans. The finality of judgment and knowledge doesn’t belong to man, whether Christian or Muslim or Communist or… whatever. By the way: the claim that there is no absolute standard for judging, that everything is relative, is an absolute standard itself. It’s a matter of belief. A metaphysical stance. And again: I don’t believe this claim. In short, I’m just very skeptical to the belief that the nature of reality (and its characterization) is limited to the possibilities of human judgment and perception. I’d like to keep an open mind and leave other options open, at least. Since this blog is about Girard`s anthropological theory: If there was indeed an absolute standard of judgment, it could well be the standard of the innocent victim, which is in the centre of Christian thought. The modern world has internalized this standard so completely that it is not even aware of it. With regard to phenomena like scapegoating it would be quite absurd to deny this absoluteness, because such a denial would imply that in another time or in another culture it could possibly be morally good to chase innocent victims. So if the absolute standard that Christians claim, as Atomic Mutant writes, was concern for the weak and the tormented, there would really be nothing to be held against it. That this standard was somehow “developed” by humans reasoning and in the end choosing what they thought was best for them, I doubt, however. I also doubt that societies trying to do without scapegoating are happier per se. Modern concern for victims is quite burdensome because it takes away from us the easy way out of conflicts, namely to simply blame everything on others. There must be more to this shift in perspective which Girard describes, and why not for the lack of a better concept or simply for the joy of it attribute it to some kind of divine inspiration? “Human history is steeped in blood. Millions died at the hands of imperialist powers in Africa. The genocide of Native Americans, the genocide of the Armenians by the Turks, the Nanking massacre, during which tens and perhaps hundreds of thousands of Chinese were slaughtered by Japanese troops, and the extermination campaigns of Hitler, Stalin and Mao speak to our incessant capacity for evil. These cycles of killing are part of human existence. They are ageless. All were justified by high ideals and all set loose human depravity.” – Chris Hedges in I Don’t Believe in Atheists (p.106-107). From an atheist point of view, man created religion, man created ideals and utopias – religious as well as secular – that were used to justify mass slaughter. The problem, therefore, is not something “outside” myself and my human nature. It is something within human nature that divides the world in “black and white”, for instance in “bad religion” and “good secularization”. Any form of knowledge that claims to be absolute ceases to be knowledge. It becomes a form of faith. Harris mistakes a tiny subset of criminals and terrorists for one billion Muslims. He justifies the unjustifiable in the name of civilization. The passions of atheists like Harris, hidden under the jargon of reason and science, are as bankrupt as the passions of Christian and Islamic fundamentalists who sanctify mass slaughter in the name of their utopias. Religious fundamentalists pervert and distort religion to serve their own fears and aggrandize themselves. Atheists such as Harris do the same with science and reason. The dangerous myth that confuses moral progress with material progress permits us to believe we have discovered a way out of the human predicament. It places faith in an empowered elite to guide us toward a new world. Science increases not only our power to protect life and encourage virtue, but also our capacity to inflict death and destruction. The industrial slaughter and genocides of the past century were all products of the Enlightenment and their satellite ideologies, from liberal imperialism to communism to fascism. All preached collective moral progress through exploitation, repression and violence. All were utopian. And all unleashed science and technology, in the service of war and profit, to kill human beings on a scale unseen in human history. The Enlightenment vision, because it renders all other values subservient to reason and science, allows us to divide the human species into superior and inferior breeds. It sanctifies inhumane abuse of the weak to push the human race forward. This corruption was built into the Enlightenment from its inception. The Enlightenment may have encouraged an admirable humanism, but it also led to undreamt-of genocide and totalitarian repression. Remembering that many right-wing Christians throughout Europe were enthusiastic supporters of Hitler and his solution to the “problem of the Jews”. Many right-wing Christians, especially “catholics” were deeply anti-semitic. Indeed church sponsored anti-semitism was the norm throughout most of Europe. The “final solution” was thus the INEVITABLE consequence of that historical mimetic process. And of course right-wing “catholics” were instrumental in assisting Nazi war criminals to escape from Europe after the war, with quite significant assistance from the Vatican too – why not Google Anton Pavelic!